Zip Password Recovery is a app to found your Zip's password when you forgot it. Password locks the file so the password is required to unzip the file. 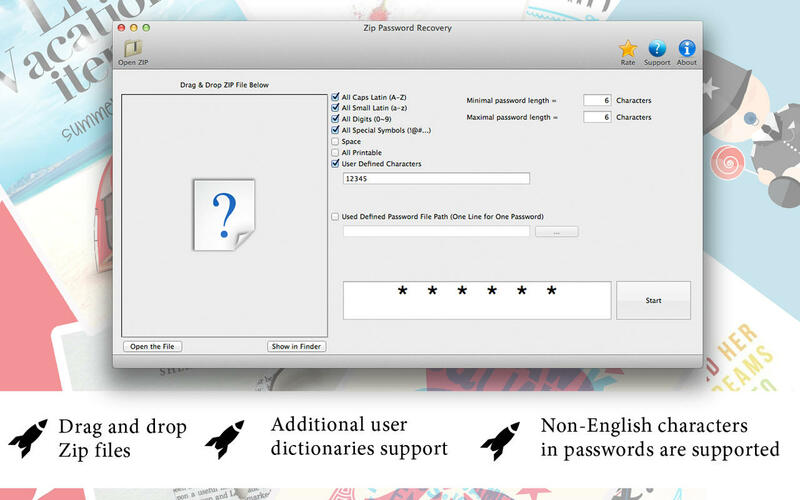 Zip Password Recovery allows to search for passwords with brute-force and dictionary attacks, effectively optimized for speed (however, don't expect to recover long passwords in a reasonable time with these attacks). Brute-force: Brute force attack for Zip file. Dictionary: Construct user password from a dictionary file. -Minimal password length: Minimal length for passwords. -Maximal password length: Maximal length for passwords. Dictionary file path: Load a dictionary file for dictionary attack.